With Jay Girvin, the founding partner at Girvin & Ferlazzo, and Daniel Rubin, a rated Super Lawyer, in the studio, this February episode is loaded with useful information on legal issues. Daniel starts the episode by harping on Jay for how much he works, recounting the story of when Jay was on the beach and Ryan called him about a case, only to learn that Jay already had the case file pulled up next to him on the sand. Jay confirms this story, and he also explains that he tells clients they can call him until midnight on weeknights and chances are he will be up — if someone calls that late, he says, it is usually because it is something important. Girvin & Ferlazzo attorneys pride themselves on this work ethic and commitment to clients in the Albany area. It makes sense, then, that Girvin & Ferlazzo has been in business in the Capital district for over 25 years, specializing in labor and employment law, municipal law, educational institutions, corporate and business transactions, civil litigation, personal injury law, medical malpractice, and real estate. Chances are, if you have a legal need, Girvin & Ferlazzo can help or refer you to someone who can. Listen to the entire radio show or read the episode synopsis below. How can employment law help me protect against sexual harassment claims? Catalyzed by accusations of sexual assault against media mogul Harvey Weinstein and Larry Nassar, the disgraced former USA Gymnastics doctor, receiving a 175-year prison sentence for decades of sexual assault, sexual harassment has become an extremely salient topic in today’s legal landscape. 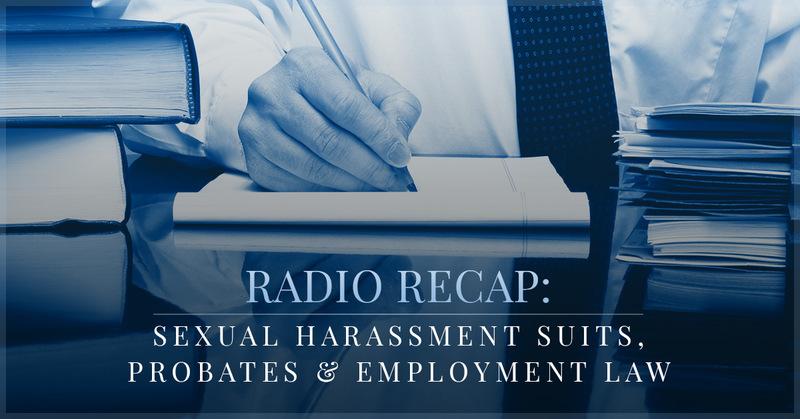 Given how important and relevant sexual harassment suits are in today’s world, Jay and Daniel begin the episode by discussing the ways employers can protect themselves — and ultimately protect their employees — from sexual harassment malpractice. The most important step that businesses can take to protect themselves against sexual harassment claims is to keep an up-to-date sexual harassment policy and train employees every year. Even if training becomes redundant for employees, what matters more is that all employees know the policy, the person to whom they can report harassment to if it occurs, and what constitutes harassment or workplace discrimination in the first place. It also behooves your company to ensure that employees confirm in writing that they have indeed received and understood your workplace’s sexual harassment policy and training. The employment attorneys at Girvin & Ferlazzo facilitate these trainings regularly for businesses and entities in the Albany area. As Jay says, companies should be in front of the eight-ball when it comes to this matter instead of on the end of a legal suit. The cost of such trainings is incredibly affordable. How do I know if I need an employment lawyer for sexual assault? Daniel explains that sexual harassment is not usually egregious or “quid pro quo” — meaning, “something for something,” or, for example, offering to promote an employee in exchange for a sexual favor. Instead, sexual harassment can often manifest in more subtle ways, like overhearing lewd conversations and feeling on-edge in the workplace. Jay, who has been leading workplace sexual harassment trainings for years, observes that the conversation surrounding sexual assault has totally changed, and that “you don’t even get one dirty joke a year.” It’s better to say nothing than to put yourself in a bad situation. For employees who might have suffered or witnessed sexual harassment, the best line of defense is to report the action. Legally, employers cannot seek retribution for any good-faith report of sexual harassment. Ideally, employers also ensure that an employee does not need to continue to work with the accused party while the incident is reviewed. As an employee, if you report and your company ignores the incident or your harasser is the person to whom you would report, you have the right to file with the EEOC, a federal agency, or the New York State Division of Human Rights, a state agency, or contact an employment lawyer for support. Mark from Latham calls in to ask a question about probate and estate law. While not a specialty area for Jay or Daniel, the attorneys give Mark general advice on the situation. Mark wonders how a person can pay a mortgage for a recently deceased person if they have not yet been named an executor of the will by a court. Jay and Daniel advise that Mark should contact the billing agencies, such as mortgage companies and banks, and let them know what has happened and say that payment will be forthcoming. Families can proactively handle this situation, even though it is a hard topic to think about in life. Parents, for instance, can name the person they want to have the house as a joint-tenant, so the house automatically transfers over at the time of death without the need for a will. Trust and estate lawyers can help with the details of this process, and Jay and Daniel recommend this investment now for the time and stress it can save in the future. Brooklyn calls in to share his story of discrimination in the workplace and the emotional stress going through a trial can take. He cautions other listeners to not make the same mistake he did: wait too long to hire legal help, assuming the case was simple enough to win alone. Instead, Brooklyn ended up getting terminated after nearly seven months on what he calls his dream job. Jay and Daniel corroborate the importance of seeking legal help and doing so promptly. They share that even experienced lawyers seek help when they have a case outside of their practice areas. Employment law, personal injury law, and medical malpractice especially can be too complicated to handle without seeking help from an attorney. The Girvin & Ferlazzo Radio Show airs on Saturdays on Talk 1300. Tune in to get free legal advice from top attorneys in the Albany area, get a legal perspective on current events, or learn more about the Girvin & Ferlazzo law firm.